BRAND NEW luxury home just one house from the beautiful Gulf beaches of Anna Maria. 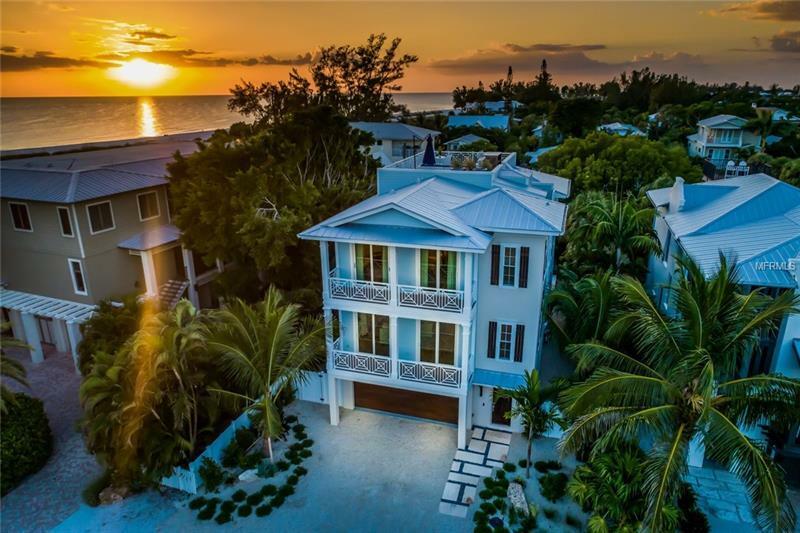 Located on one of the prettiest streets in the City of Anna Maria and only a short walk to the shops of Pine Avenue this 4 bedroom coastal home offers over 3003 sq ft of pure luxury living. In addition the large easily accessible 600 sq ft rooftop deck provides spectacular views of the Gulf (and Skyway Bridge) and an amazing place for the family to gather entertain BBQ and watch mesmerizing sunsets. The light and airy open-plan second floor is designed as an expansive haven for family and guests to entertain and unwind with two sitting rooms gorgeous dining area 10â ceilings an extravagant kitchen and a large deck overlooking the heated pool spa and tropical backyard. The gourmet kitchen includes Wolf and Sub-Zero appliances quartz counter tops custom cabinetry and a large 16' long island. The third floor incorporates 4 large bedroom 3 lavish bathrooms and the laundry room hidden behind a barn door. Other luxuries include upgraded wood-look tiles throughout the house elevator to all three floors tank less water heater outdoor shower and smart-home technology which allows you to control your thermostats cameras front door bell garage doors and sound system from your smart phone or tablet. Professionally decorated and constructed by local builders who were born and raised on the island this home offers the ideal beach getaway to relax and be pampered with family and friends. Copyright © 2019 Mid Florida MLS. All rights reserved. The data relating to real estate for sale on this web site comes in part from the Internet Data Exchange Program of Mid Florida MLS. Information provided is for consumer's personal, non-commercial use and may not be used for any purpose other than to identify prospective properties consumers may be interested in purchasing. participates in the MFRMLS Internet Data Exchange (IDX) program, allowing display of other MFRMLS broker's listings on this site. However may not include all listings currently available. Information is deemed reliable but not guaranteed. Information last updated at 2019-04-21 18:38:24.